Ramadan, the most spiritual month of the year for Muslims, has finally arrived. As the most populated city and top tourist destination of Turkey, Istanbul is ready to host a number of Ramadan events for both Muslims and non-Muslims who want to experience Ramadan at its fullest.This year's Ramadan events in Istanbul are organized by the Istanbul Metropolitan Municipality (İBB), mainly in major city parks including Yenikapı and Maltepe as well as historic and spiritual districts of Istanbul such as Sultanahmet and Beyazıt. The municipality offers a wide range of events, including Sufi music concerts, poetry nights, traditional art shows and panel sessions in the month of Ramadan. Since Ramadan coincides with summer this year, Istanbulites and people who want to spend Ramadan in Istanbul will be able to enjoy Ramadan events throughout the month every night until sahur, the pre-dawn meal. İBB has not forgotten the children as well. At every event area, there is at least one event geared toward children. The little ones who visit the event areas with their families will have a chance to enjoy competitions and traditional stage plays. This year, there is no increase in the price of iftar menus offered at the social facilities of İBB. The iftar menus of the restaurants which offer tastes from traditional Ottoman and Turkish cuisines cost TL 35 per person. Award-winning chefs will ready the iftar tables for a feast at the İBB's social facilities in Beykoz, Dragos, Gözdağı, Fethipaşa, Çamlıca, Florya, Arnavutköy and Haliç. Sultanahmet Square, which is one of the places frequented by both Istanbulites and tourists during Ramadan, is hosting a Century-Old Tastes and Arts Market. Throughout Ramadan, stalls set up at the square will offer a taste of traditional Ottoman cuisine. Moreover, professions that have fallen into oblivion in time will be re-introduced for the new generation. Visitors will also have a chance to observe calligraphists and marbling artists while they are doing their magic.Yenikapı is hosting the largest Ramadan events in Istanbul's European side. Covering a total of 700 square meters, the Yenikapı Event Arena which offers free Wi-Fi, a health room, free telephones and markets for your every need, has a capacity of over 1 million people. 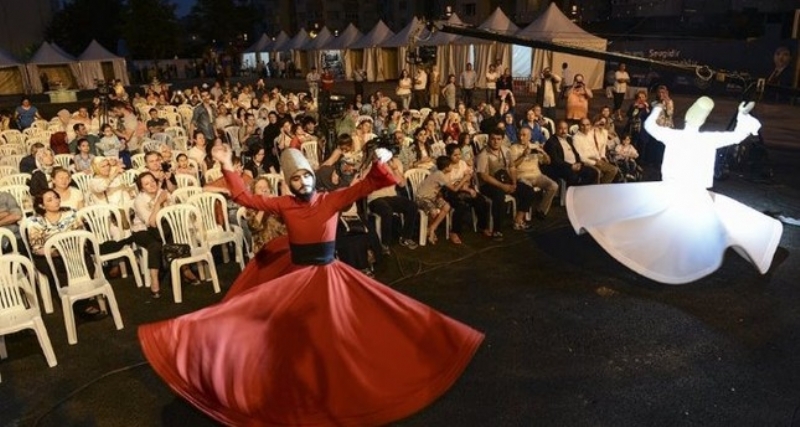 Yenikapı will host iftar every day along with concerts, panel sessions, and traditional Ramadan shows such as shadow puppetry as well as open-air theater. The municipality also erected a tent which will serve as a small mosque for Muslims who want to pray. The tent is for both men and women, and visitors coming to Yenikapı for iftar will be able to perform their tarawih prayers in the tent. The authorities expect roughly 25,000 visitors every day. People break their fast in Sultanahmet throughout Ramadan. Istanbul's Maltepe, on the other hand, is hosting the largest Ramadan events on the Asian side. Europe's largest social, sports and entertainment center, which covers 1,200,000 square meters, will be ready to welcome thousands of people every day during Ramadan. Maltepe is hosting pre-iftar entertainment for children and Sufi music concerts for adults. After the iftar, Maltepe will be a huge scene for mehteran (Ottoman janissary band) concerts, shadow plays, stage plays and nostalgic film screenings. After the tarawih prayer, the events in Maltepe continue until sahur. The historic Beyazıt Square is going to be the place where you can feel the spirituality of Ramadan in Istanbul. Beyazıt is hosting poetry readings, Sufi music concerts, whirling dervish shows, film screenings and playgrounds for children. Organized by Turkey's Diyanet Foundation with the support of Istanbul Metropolitan Municipality, the Turkey Book and Culture Fair has opened its doors to visitors at Beyazıt Square as well. The 36th edition of the fair allows visitors to get their hands on books by Turkish and international authors at a reasonable price. Just like it does every year, the İBB continues to erect iftar tents all over the city. The tents, which bring Istanbulites together for the meal, create a sense of solidarity throughout Ramadan. Every day, 50,000 Istanbulites will have a chance to share a table and have iftar together in open air and experience Ramadan spirituality together. If you are in Istanbul and cannot make it home for iftar, you do not have to worry. The İBB has opened "iftar counters" in Istanbul's central locations such as Kadıköy, Eminönü, Şişli and Bakırköy, and offer iftar meals to those who want to break their fast on their way. The counters will be open 24/7 throughout Ramadan and serve at least 1,000 people every day.